With two minutes and 15 seconds remaining in the fourth quarter on Sat­urday, the Hillsdale College Chargers trailed 19 – 14 in round two of the NCAA Division II playoffs against the Notre Dame College Falcons. Senior quar­terback Chance Stewart took the field at the Chargers’ 25 yard line, hoping to guide the team on a game-winning drive. In 125 seasons of Hillsdale College football, the program had never advanced to the third round of the NCAA playoffs. Now, the Chargers were 75 yards and 135 seconds away from making history. The Chargers trailed 10 – 0 at halftime and took a 14 – 10 lead in the third quarter, but nine unan­swered points late in the fourth quarter by the Falcons set up a do-or-die final drive for Hillsdale. “Over and over again this year you saw, if a little some­thing didn’t go our way, instead of folding up and crum­bling, we were right back up, throwing punches and right back at it,” Stewart said. Earlier this season, on opening night, the team waited in the locker room for two and a half hours during halftime because of lightning before returning to the field to finish a gru­eling 14 – 9 win against Mer­cy­hurst Uni­versity on Sept. 1. A short com­pletion sand­wiched by a pair of incom­plete passes began Saturday’s final drive, setting the Chargers up with a 4th-and-2 sit­u­ation from their own 32 yard line and less than two minutes to go. Against then-No.12 Ohio Dominican Uni­versity Stewart threw inter­cep­tions on Hillsdale’s first three drives on Sept. 15, but the Chargers stormed back in the final three quarters to shock their con­ference rivals on the road in a 34 – 18 victory. 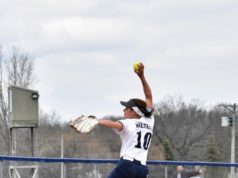 The win was the first in an unde­feated con­ference season for Hillsdale. Under heavy pressure from the Falcons’ pass rush, Stewart scrambled to his right on 4th-and-2 and, with defenders draped all around him, found freshman wide receiver Alec Foos for a five-yard com­pletion and a fresh set of downs. On Oct. 6 against the Uni­versity of Findlay, the Chargers fell behind early, 10 – 0. But Hillsdale rallied to tie the game at 17 by the end of the third quarter, and a 51-yard, game-winning field goal by sophomore kicker Joe Philipp with less than two minutes left sealed a 20 – 17 victory. Now at the Chargers’ 42-yard line, Stewart found junior running back David Graham for 19 yards to move the ball into Notre Dame ter­ritory on a 3rd-and-6 play. But a holding penalty against Hillsdale set the Chargers back to their own 32 for another third down, this time a 3rd-and-16. Unfazed, Stewart launched a pass down the right sideline for senior wide receiver Trey Brock, who leaped to make the catch at the Falcons’ 27 yard line for a 41-yard com­pletion and a first down. On Nov. 3, the Chargers trailed Tiffin Uni­versity 19 – 17 at halftime in the game that would decide the G-MAC champion. But Hillsdale outscored Tiffin 31 – 7 in the second half, and led by Brock’s four touchdown recep­tions, the Chargers fin­ished the con­ference schedule unde­feated and earned G-MAC cham­pi­onship rings. The Chargers faced 3rd-and-17 from the Notre Dame 34 yard line after another ques­tionable holding penalty. But Stewart found senior wide receiver Austin San­dusky cutting across the middle of the field for a 20-yard com­pletion to move the chains with less than 20 seconds to go. In round one of the NCAA Division II playoffs, Hillsdale trailed Kutztown Uni­versity 20 – 6 at halftime after being held to one first down in the first two quarters. But the Chargers led before the end of the quarter and outscored Kutztown 34 – 6 in the second half en route to a 40 – 26 playoff triumph. One week later, the Chargers faced 2nd-and-10 from the 14 yard line with seven seconds left in the game. Stewart took the snap and was flushed out to his right. He searched for the end zone, and for the final time in his illus­trious Hillsdale career, zeroed in on Brock. His throw was tipped near the goal line, however, and fell incom­plete past Brock through the back of the end zone. The clock showed all zeroes, and the Falcons had sur­vived, 19 – 14. Hillsdale’s season was over in round two of the playoffs. The Chargers were indeed used to getting back up and throwing punches. They didn’t stop doing so on Sat­urday. They simply ran out of time. Stewart fin­ished the game 17 for 36 for 322 yards and a 40-yard touchdown pass to Brock in the third quarter. Stewart also ran for a touchdown, a one-yard quar­terback sneak at the goal line, to get the Chargers on the board on their first pos­session of the second half. 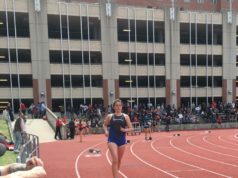 But it was Hillsdale’s final pos­session of the season that stuck with Stewart. Much like their first-round playoff game, the Chargers struggled to create any momentum on offense in the first half. 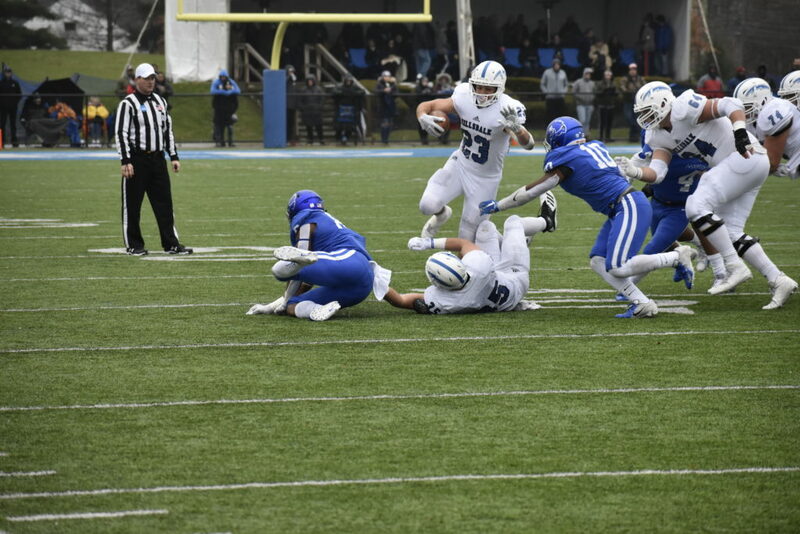 Hillsdale did have one golden oppor­tunity to score in the first quarter after junior defensive back Drake Temple inter­cepted a pass and returned it to the Falcons’ 27 yard line. But on 2nd-and-goal from the six yard line, Brock took a handoff on and end-around play and fumbled with a clear path to the end zone. Notre Dame recovered at the two yard line. After two scoring drives put Hillsdale ahead 14 – 10 in the third quarter, the Chargers again moved the ball deep into Notre Dame ter­ritory by the beginning of the fourth quarter. But on 3rd-and-goal from the one yard line, Stewart fumbled on a quar­terback sneak after appearing to reach the ball over the goal line. The call on the field, however, was a fumble, not a touchdown, and the Falcons took over while the Chargers came away empty. Although the Chargers found some success in the air during the second half, Hillsdale never got the running game going, and accu­mu­lated neg­ative two yards on the ground in total. Notre Dame’s ath­letic defensive line played a part in that, and pres­sured Stewart all afternoon long whenever he dropped back to pass. Stewart was sacked six times. On defense, the Chargers col­lected a season-high 13 tackles for loss. Senior line­backer Jay Rose and freshman defensive lineman Kyle Parran accounted for three and a half each. Rose led Hillsdale with 14 total tackles, and Parran col­lected the Chargers’ only sack. After allowing nearly eight yards per rushing attempt in the first half, Hillsdale’s rush defense tightened up in the second half. 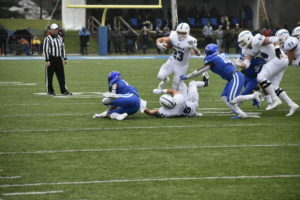 Senior defensive back Wyatt Bat­dorff said that was a result of Hillsdale’s defensive linemen focusing on plugging up the interior running lanes, allowing play­makers like Rose and Parran to make plays outside the tackles and in the back­field. The Chargers finish the season 10 – 3, the most wins they’ve had in a single season since 2009, when they had an iden­tical record. That team also lost in the second round of the playoffs. Hillsdale is now 2 – 3 all-time in NCAA playoff games, all under Otterbein, who was awarded the G-MAC Coach of the Year award at the end of the regular season. Otterbein won the Coach of the Year award twice, in 2009 and 2011, when Hillsdale was in the GLIAC. Otterbein will be back for his 18th season as head coach in 2019, when Team 127 makes its debut. But for just a little while, he has an oppor­tunity to reflect on the special season Team 126 put together. Dis­ap­pointing loss, sure. But the Chargers played far better than I thought they would against #1 seeded NDC. The game came down to lack of a running game on our part, we couldn’t slow down their pass rush and keep their DL off of Chance and the two fumbles at the one yard line. Even so, we came very close to hitting Brock in the end zone for the winning TD. Many of the starting players are coming back next season, including all 4 of our DL and 4 out of 5 of our OL. The biggest chal­lenge will of course be replacing QB Chance Stewart, who has broken every record at Hillsdale College. AND replacing Trey Brock and Austin San­dusky at WRer. The players are there, but they need to step up and make a statement for them­selves. I’m really going to be watching the battle for starting QB, we have some tal­ented under­classmen and the one who works the hardest will land the coveted spot next season.